How Many Researchers Can You Really Afford? Academic medical centers’ reputations are rarely built on the quality of clinical care or the quality of education. Reputations are built on the volume of research grants and publications. The academic medical center becomes famous by doing research about clinical care and publishing about education. Similarly, to be promoted as a faculty member at most colleges of medicine in the U.S., it is not enough to be a great clinician or great teacher, you have to do research and publish about medicine and teaching. In theory, devoting a lot of time to research and publication about clinical care and education will also make the institution a better place to provide clinical care and medical education. But in reality, the best researchers and journal article writers are not necessarily the best clinicians or teachers. To be successful obtaining and implementing research grants, physicians have to have “protected time”. This is time that they are not assigned clinical duties and can devote to scientific investigation and writing in order to be competitive for research grants. The most prestigious grants for physicians are those from the National Institutes of Health and these grants provide money to conduct research projects and also provide money to pay for the physician’s “protected time”. But we have a problem in American research. Grants from the National Institutes of Health don’t really cover the physician’s protected time. It all comes down to something called the NIH salary cap. This is the maximum salary that can be paid from an NIH grant. Currently, the salary cap is $185,100. To any normal human being, this seems like a lot of money, a whole lot of money. The problem is, that physicians doing clinical practice usually make more than this. In fact, according to the MGMA salary survey, the average salary for most specialties is higher than $185,100. This means that to be a researcher, you either have to accept a lower salary than a clinician in the same specialty or someone else needs to subsidize your salary. Lets take an example of a group of physicians who have 50% protected time, meaning that they see patients half of the work week and do research funded by the NIH for the other half of the work week. In the table below, the salary is taken from the MGMA survey. The the cost of 50% protected time is listed as 50% salary. The NIH salary cap is for a 100% full-time researcher is $185,100, so half of that (to cover the 50% protected time) is listed as 50% NIH cap. 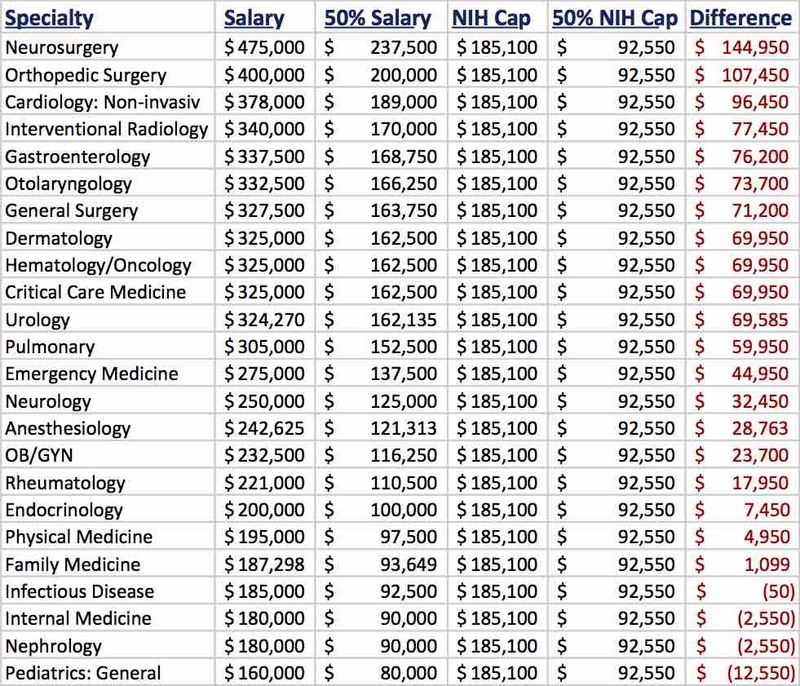 For most specialties, the NIH salary cap will not fully cover the salary that the physician would receive if her or she was a full-time clinician; this difference is listed in the last column. From this analysis, you can see that a hospital can afford to have 4 specialties do research without having to subsidize them: infectious disease, general internal medicine, nephrology, and general pediatrics. For any other specialty, the hospital has to come up with additional funds to make up the difference between the NIH salary cap and what that physician could make doing pure clinical practice. Neurosurgeons are the most financially challenging since they have the highest salaries: you can fund 19 endocrinologists to do research for the price of funding one neurosurgeon. In reality, most researchers accept a lower income than full-time clinicians. Researchers don’t have to round on weekends, don’t get called in at night for emergencies, and don’t have malpractice suits filed against them. But there are limits and even the most scientifically curious physicians will find the allure of an extra $50,000 or $100,000 too much to keep them in research. As a consequence of this, an academic medical center that wants to get the greatest return on research investment will seek a lot of researchers from endocrinology, physical medicine, infectious disease, and nephrology. Researchers who are neurosurgeons, orthopedic surgeons, and cardiologists are too expensive to have more than a small number of researchers. One of my colleagues who is a cardiologist on his division’s finance committee once told me that that the worst news he can get is a mass congratulatory email from the division director telling all of the cardiologists that one of their peers just got an NIH grant. The unwritten implication of that grant was that the rest of the cardiologists were going to have to pony up to help subsidize the portion of the grant awardee’s salary not covered by the NIH salary cap. Now days, the clinical physicians usually can’t afford to pay this difference because it means that they have to take a pay cut in order to support their research colleagues. Therefore it comes down to the hospital to provide the salary difference subsidy. So as a hospital medical director, how should we view this? We only have a limited amount of money to invest in researchers so we have to be prudent in how we spend it and who we spend it on. It is like investing. For high salary specialties, the hospital can only afford a small number of researchers and they have to have a high probability of research success – think of this as buying 1 expensive stock share in Apple. For lower salary specialities, the hospital can afford a larger number of researchers and can afford to take a chance on researchers with a less certain probability of research success – think of this as buying 1 inexpensive stock share in each of 10 start-up companies. The holy grail of research funding is the endowed chair where the academic medical center can use money from donors to off-set the NIH salary cap difference. This is pretty easy at a well-endowed college of medicine like, for example, Harvard. But it is not so practical at a state-supported college of medicine (like Ohio State) with relatively meager endowment funds. For institutions with less endowments, you have to decide what the right ratio of clinicians:researchers is. That ratio will vary depending on the specialty and the percent protected (research) time that the researchers have. The goal is to have the right balance so that you have enough research to make the institution famous but not so much research that institution goes into debt.